The CI301 is a multi-function 0.1 sec to 497 day programmable timer module. 14 timing modes include simple Delay Timer, Delayed-On, Re-Triggerable and Turn-Off Delay with Pause, Cumulative, Reactivation and Resetting of the delay period. 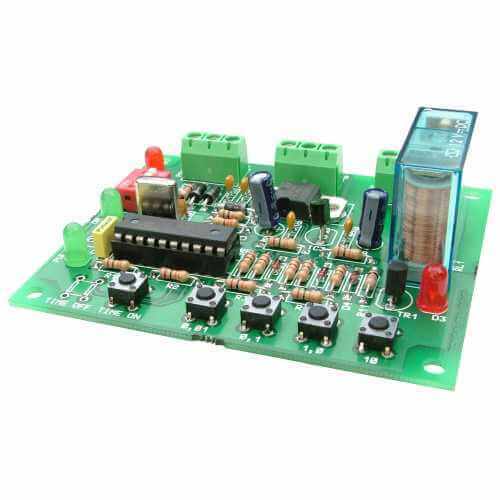 Accepts either 12 or 24Vdc power supply. Easy setting of Mode and Time using onboard DIP switches and programming buttons. Time and mode settings are retained if power is removed. Inputs for Start and Reset buttons. Dimensions 87 x 72 x 26 mm.